during fast,u can have this as a main food.tasty puri.easiest way to roll is keep the dough inside ziplock cover and roll with the rolling pin.otherwise it will not come. First, mash the boiled potatoes. In a large bowl,mix rajgira flour,mashed boiled potatoes,green chilli,coriander leaves and salt and knead with sufficient water and add little oil at the end so that it doesn't stick. Make a stiff dough.Divide the dough into 10 equal portions. In a ziplock cover,take the dough and keep it inside and close it. Then in the rolling pin,make it round shaped of 3 inch. Heat the oil and Deep fry till golden brown on both sides. Drain them in a paper towel. Serve hot with dum aloo or any upwas sabji. Dear Raje , Very healthy puri's . Thank U . Amaranth flour are considered to be a complete protein got from plants . They have all 9 of the essential amino acids that our body needs to function properly . Amaranth flour has more nutrients like Calcium , Iron , Zinc than any other grains including Quinoa , Whole wheat , Rye , Oats , Barley , Buckwheat or Millet . Amaranth flour has one of the highest percentage of fiber compared to other grains and it's naturally gluten free . 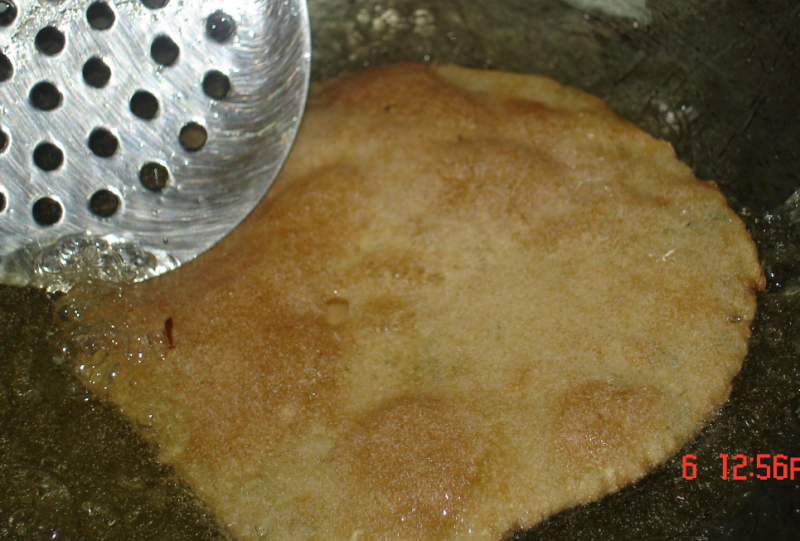 in the 5th step.after making like puri shape,kindly take out from the ziplock cover and deep fry.in the ingredients oil is missing.Kindly take sufficient oil for deep fry.